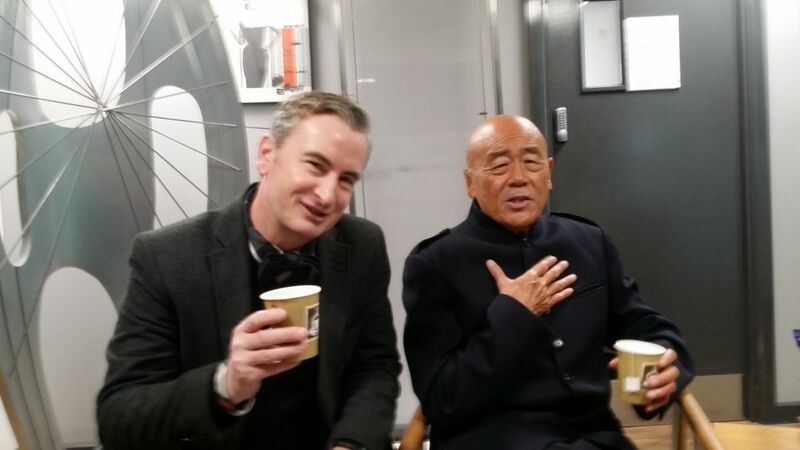 When I said I was meeting Ken Hom, a younger colleague said “oh, isn’t he the guy who invented the wok?” Well, I guess he did, in a way, by putting a flat bottom on it in 1986, so we could use it on our UK stoves. 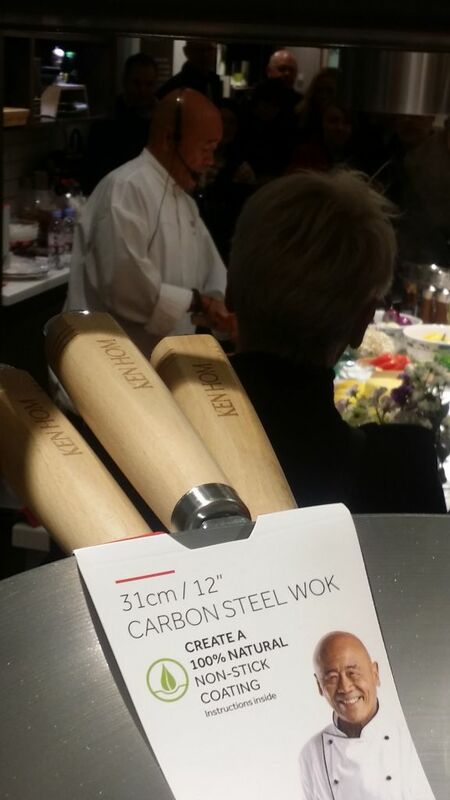 Now at least one in seven people in Britain own a Ken Hom wok – me included. But after meeting the man and seeing him in action I realise I’ve been woking wrongly all these years. I throw everything in, shake the pan about violently and serve up an uneven and soggy mush. Whereas, Ken cooks with such care and finesse and personally competes with the warmth and brightness of the induction ring. He’s also calm and very funny. Full of stories about the waft of the street sellers’ food in Bangkok driving him on to do more lengths in his swimming pool, being berated for not serving milk with his jasmine tea and being mistaken for the Dalai Lama. He exudes joyful charm and time with him passes quickly. What I’ve learned from master Ken Hom is to heat the pan up for a few minutes, before adding a little oil – never sesame oil, it’s for dressing, and stir fry the meat first, before putting aside to drain the fat. Then into the hot pan – no more oil – add the vegetables, and in the right order. Onions and heavier vegetables first, with some stock and rice wine, testing with a knife to see if they give way when pressed. Then add the lighter things like mange tout and beansprouts before putting back in the meat, adding a sauce and serving up. 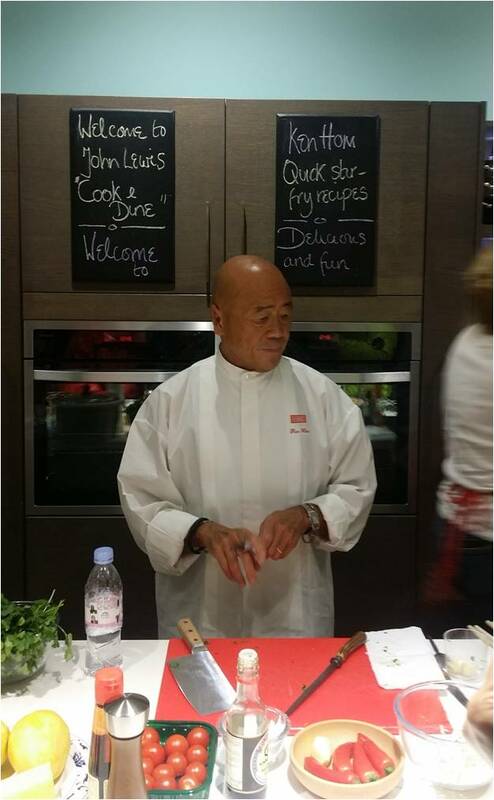 For this demo at John Lewis Oxford Street he shows us chicken with fish sauce and pineapple giving it a Thai sweet and sour twist, juicy beef – he only uses fillet steak and a fried rice with a healthy dose of curry paste. Simple variations that make classics taste even better. Ken is full of tips – we get that we never wash the wok in washing up liquid – unless you like the taste of soap and we lightly oil before putting away it away. However, the science has changed a lot in 30 years. When he first tested a non-stick pan the surface used to peel off. Not so now. So unless you live in Penzance or Penang you won’t need to take so many precautions against a pan rusting, as it used to do. Remember 1986? Spain and Portugal joined the EEC, Chernobyl exploded, the London stock market had the The Big Bang and the UK and France announced plans to construct the Channel Tunnel. And lurid yellow Chinese curry and chips? Some things have moved on, and Ken firmly believes to enjoy life and be happy means to eat well. We are doing that thanks to him. 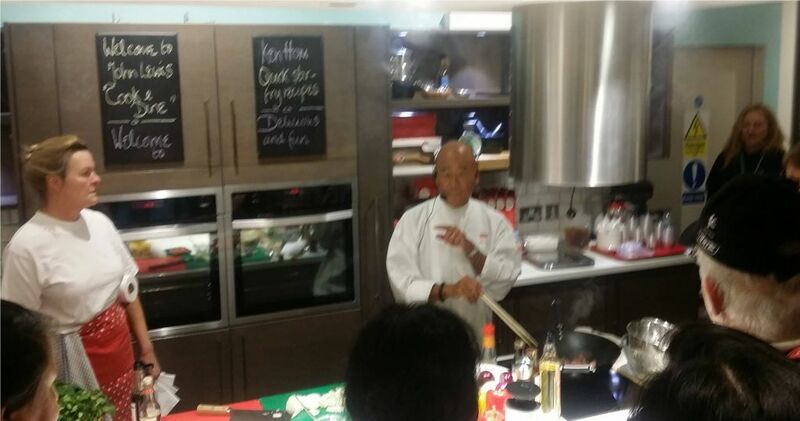 Today, Ken Hom’s woks are available from major UK outlets with the practical ‘Everyday Range’ and the ‘Performance Range’, used by Ken Hom himself. There’s a Carbon Steel Wok, a Non-Stick Carbon Steel Wok & Grill Pan and a Non-Stick Carbon Wok Set priced from £18.99 to £62.99.